In the third installment to the Irish Country series we happily retreat back into Dr. Barry Laverty and Dr. Fingal Flahertie O'Reilly lives around the Christmas holiday. As they share the practice that Dr. O’Reilly started their bond is getting stronger. Dr. Laverty hopes that his girlfriend, Patricia, can make it to spend the holiday with him and Dr. O’Reilly rekindles an old flame. Meanwhile the characters in town are a loveable and sometime silly group of Irish folk. I love this series not only because you don’t have to read it in order but it reminds me of how Ireland feels when you visit it. It is magical, friendly and relaxing. It feels like going home to me. Of course my heritage has a lot of irish in it so it is only natural for me I guess. Some people complain that the books are getting redundant and have formula but I do not feel that nor would I mind if it was. 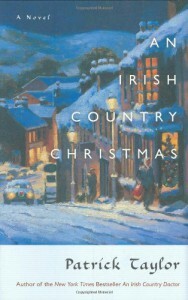 The Irish Country stories are a nice cozy and warming stories that feel real to me. They are plausible stories that usually end with a happy ending. I have realized something about happy endings. I use to get bored of them but now I realize I like them more than any other ending. If your life were a book which ending would you like? Not many of us get happy endings and it is what I hope for and if I don’t get it at least I live briefly in a book that does.